This article explains how to set up single sign-on (SSO) for Atlassian Confluence 5 using OneLogin's SAML Plugin for Confluence. Note. OneLogin's SAML Plugin for Confluence supports Confluence up to version 5.0.6. No later releases are supported. We have open-sourced the plugin, which you can get at https://github.com/onelogin/atlassian so that customers can modify it to support later versions. Go to Apps > Find Apps. Search for and select the Confluence 5 connector. On the Add Confluence 5 page, click Save to add the app and display additional configuration tabs. On the Configuration tab, enter the Confluence login URL. Enter the login URL of the Confluence server, using the format https://hostname:port without a trailing slash "/". For example, https://confluenceserver:8080. On the Parameters tab, select how credentials are configured and map the Confluence Username field to a OneLogin attribute. Typically, the Confluence Username should be set to Email name part. 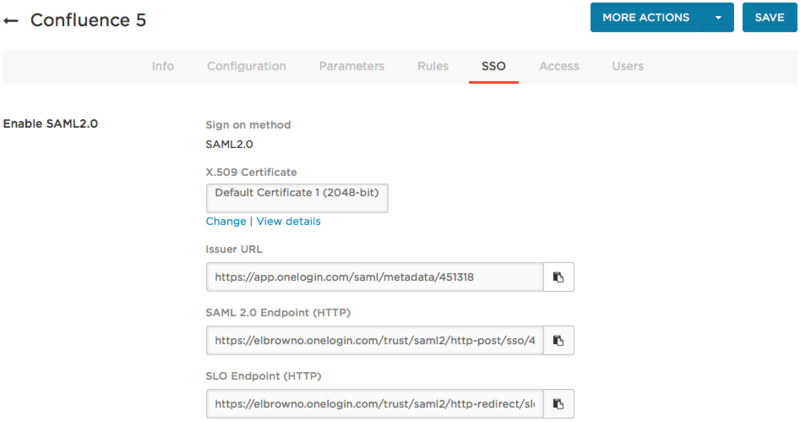 On the SSO tab, copy the SAML 2.0 Endpoint (HTTP) URL and click View Details under the X.509 Certificate field to copy the certificate. You will add these to your conf_onelogin.xml file in a later step. On the Access tab, assign the Confluence app to OneLogin roles. Ensure that your CONFLUENCE_USER has read permissions on these files. To perform this configuration, you must be logged in as a user with write permissions on these files and the files in your CONFLUENCE_INSTALL directory. Edit conf_onelogin.xml to add the X.509 certificate and SAML 2.0 Endpoint that you copied above. Paste the certificate between the <certificate></certificate> tags, removing all line feeds or carriage returns in the certificate value. Paste the SAML 2.0 Endpoint between the <ssotarget></ssotarget> tags. Copy conf_onelogin.xml into CONFLUENCE_INSTALL and CONFLUENCE_INSTALL/bin. Your installation directory may be different. Restart the Atlassian Confluence service.